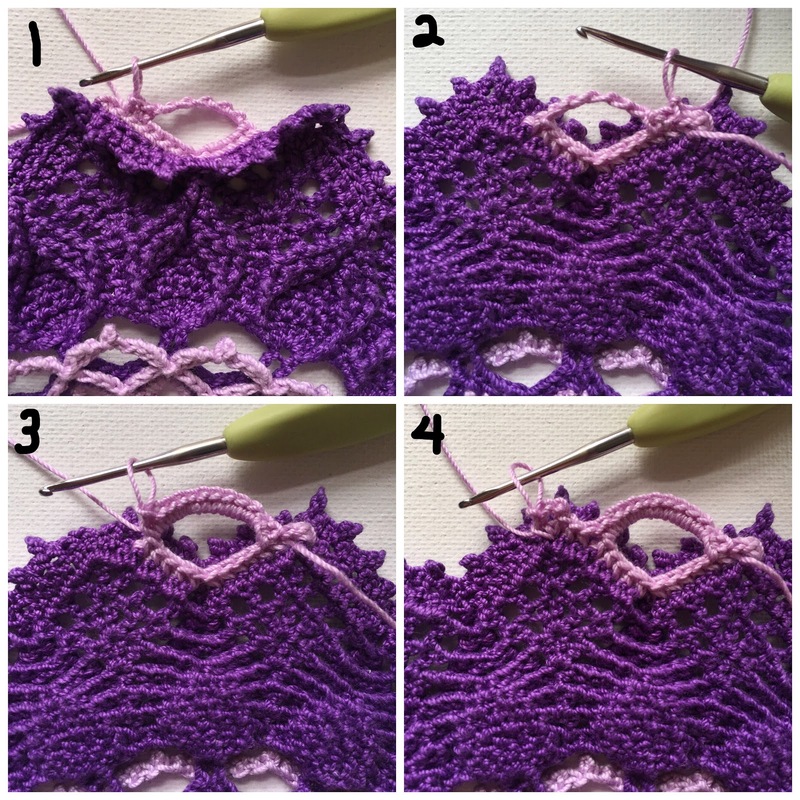 This is Part 3 of the Arcanoweave doily. The pattern continues where Part 2 left off, starting on Round 20 and ending with Round 41. There are 22 rounds and the finished size is about 14". Pattern is written using U.S. Terminology. FPdc decrease- keeping last loop of each FPdc on hook, FPdc around the post of next 2 sts indicated, yo and draw through all 3 loops on hook. small picot- ch 2, slip st in second ch from hook. ★ - repeat the following instructions the amount of times indicated. ( ) - Enclose additional information and the number of stitches at the end of a round. 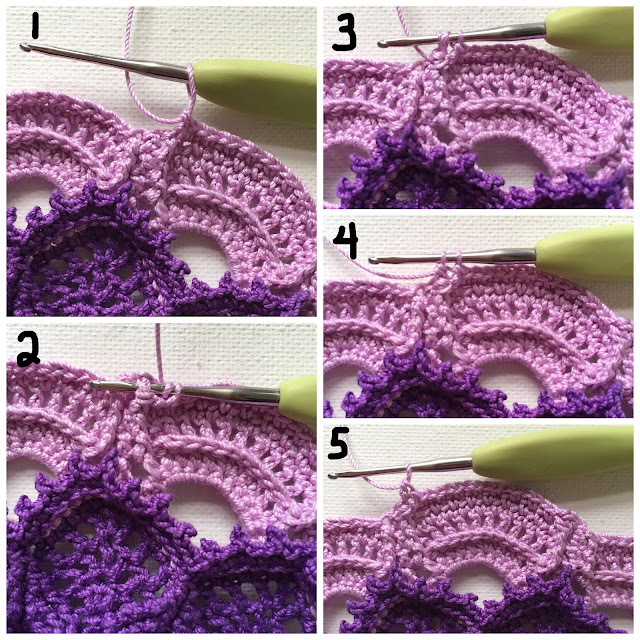 The doily may start to curl in after Round 36 which is normal and should be fine once blocked. 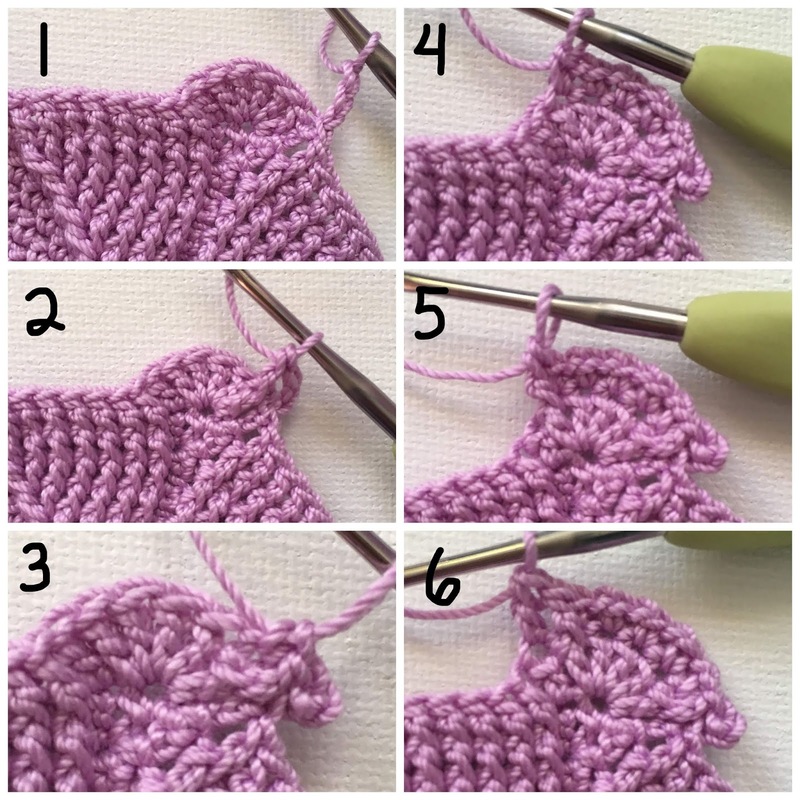 It is optional but recommended to block your finished piece. Fill a bowl with water and add some liquid starch if you prefer the doily to be lightly stiffened. Soak the doily and gently press out any excess liquid, being careful not to pull or twist on the stitches. Lay it flat on a blocking mat and pin the doily working from the center out to the edges. Allow the doily to dry completely before removing the pins. 1- With the wrong side of the doily facing up, join the thread around the post of center dc of any 15 dc group on Round 18. Ch 1 and FPsc around the same st.
2- FPsc around each of next 7 dc on Round 18. Skip the next FPdc decrease. FPsc around each of the next 5 dc. 4- Turn your work over so the right side is now facing up. 1- Skip the next 9 sc, sc in the next sc, slip st in the next sc. 2- ch 1 and turn your work back over so that the wrong side is facing up. 3- 11 dc in the ch-7 space just made. 4- FPsc around each of next 2 dc on Round 18. ★ [FPsc, ch 3, FPsc] around next dc, FPsc around each of next 7 dc, skip next FPdc decrease, sc in each of next 5 dc, ch 7, turn, skip next 9 sc, sc in next sc, slip st in next sc, ch 1, turn, 11 sc in next ch-7 space, FPsc around each of next 2 dc on Round 18, repeat from ★ around, FPsc around next dc, above the first FPsc made, ch 1, hdc in first FPsc to make last ch-3 space. FPdc twice around next FPdc, making the second FPdc behind the first. It helps to make the FPdc stitches on the left side of the pineapple look the same as the FPdc stitches on the right side. 1- After completing the last sc of the pineapple, FPdc around the next FPdc. 2- yo, and pull the FPdc just made to the front so you can work behind it. Insert hook from front to back around the post of the same st as the last FPdc made. 3- Yo and pull up a loop. (3 loops on hook). 4 and 5- [yo, and draw through 2 loops on hook] twice to compete the second FPdc. 1- Ch 3 to start the round. 2- FPdc around the next dc. 3- Pull the FPdc just made to the side and working in the same dc make a sc. 4- continue the round with- [ch 1, sc in next dc] 4 times. 5- FPdc around the post of the same dc as the last sc made. 6- dc in the next dc. 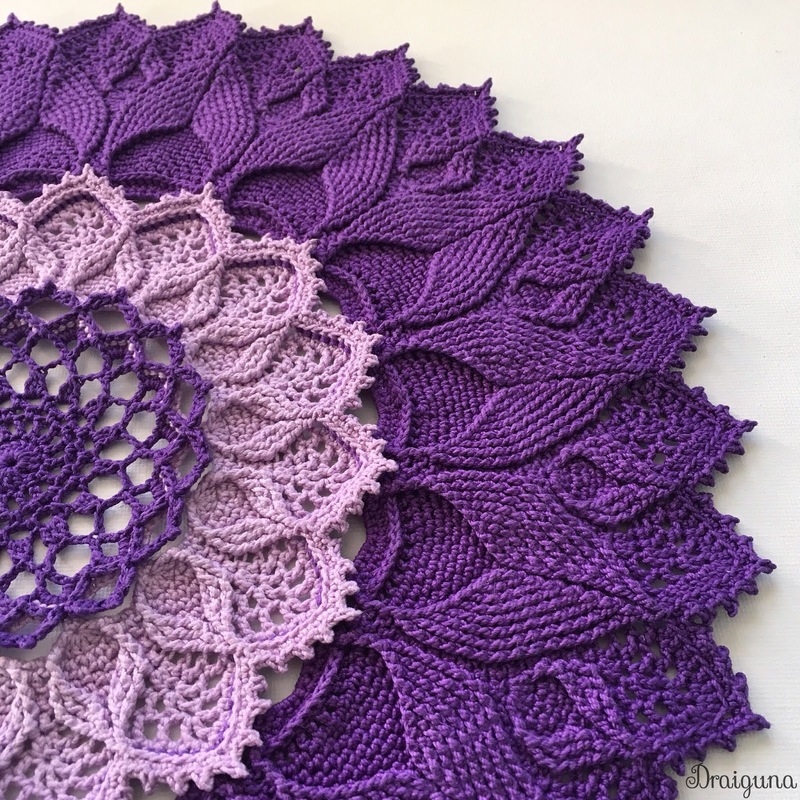 This pattern is by Julia Hart of Draiguna. 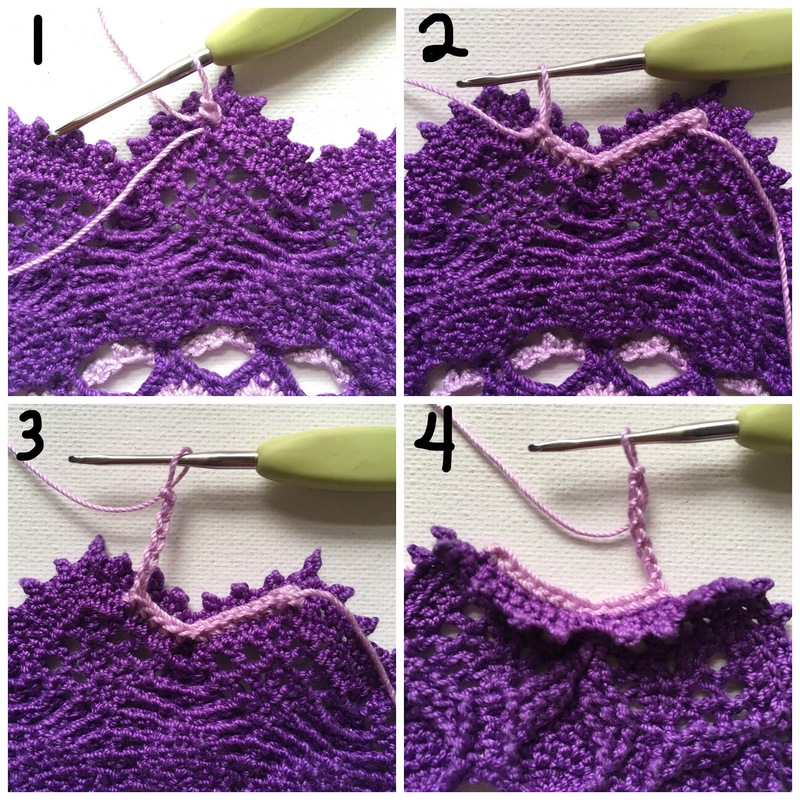 Feel free to link to this pattern but do not reprint it on your site. You can sell items made from this pattern. Please credit me as the designer, Julia Hart of Draiguna, link to my etsy shop- draiguna.etsy.com, or to my blog- www.draiguna.com. Please do not claim this pattern as your own, sell, or distribute it. This includes making charts or graphs of the pattern. Thank you!